This procedure is performed by the Veeam Backup Enterprise Manager Administrator on the Veeam Backup Enterprise Manager server. Copy the obtained request to the Clipboard. In Veeam Backup Enterprise Manager, go to the Configuration > Key Management section. 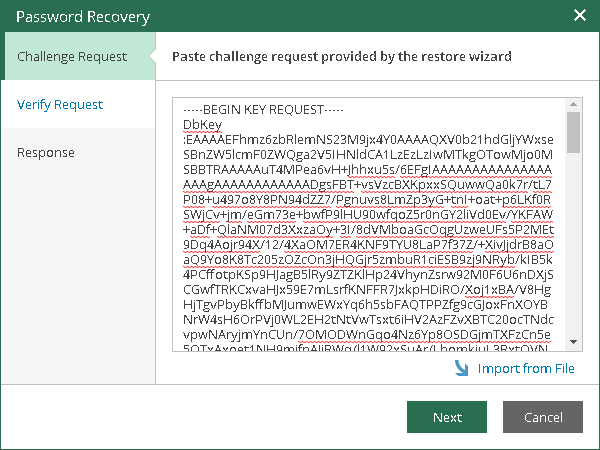 Click Password Recovery at the top of the section to open the Password Recovery wizard. 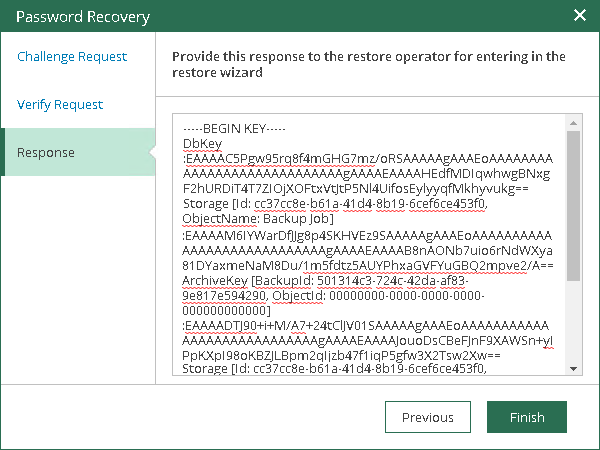 Paste the request that you have received from the Veeam Backup Administrator. You can use the [CTRL+V] key combination or click Paste at the bottom of the wizard. Follow the next steps of the wizard. At the Response step of the wizard, copy the text displayed in the wizard to the Clipboard. Send the copied response by email or pass it in any other way to the Veeam Backup Administrator working on the backup server.